English-speaking volunteers are now wanted for the English program for Japanese students! 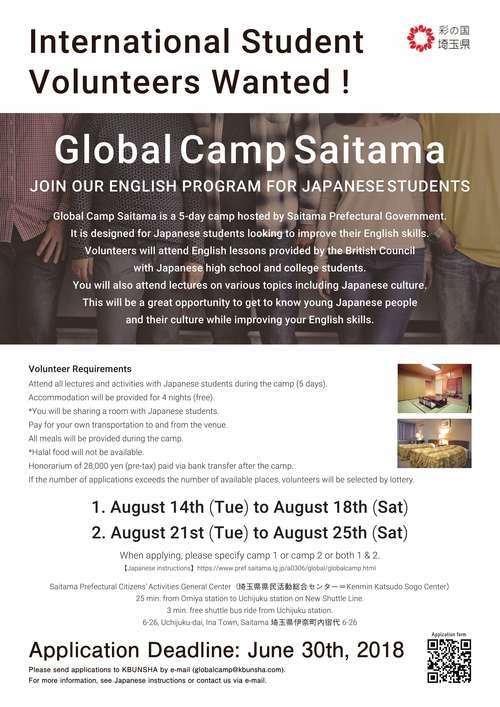 Global Camp Saitama is a 5-day camp hosted by Saitama Prefectural Government. It is designed for Japanese students looking to improve their English skills. Volunteers will attend English lessons provided by the British Council with Japanese high school and college students. You will also attend lectures on various topics including Japanese culture. This will be a great opportunity to get to know young Japanese people and their culture while improving your English skills. How to Apply: Please read the QR code on the attached poster or visit the application website to send your application.